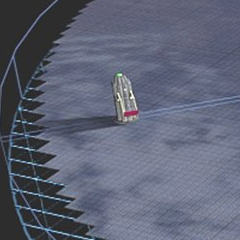 SSP is a simple idea (pictured above). 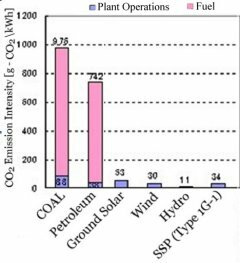 By collecting the sun's energy in high orbit, almost ten times as much energy per panel - reliable, low-CO2 energy(graph right) can be collected. Rising energy costs slow the economy through higher food, transportation and goods costs. Growing global demand for energy to keep our world running results in a heavier environmental footprint, as we are forced to environmentally and financially more challenging fossil fuels. Transitioning energy production directly to the sun is the best way to cleanly repower planet Earth. We must add Space Solar Power (SSP), our best energy alternative, to our energy mix. 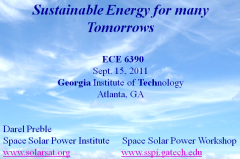 Ga Tech's ECE6390 satellite design class project required each team to design a Space Solar Power System. Funds from the friends and family of Bill Brown endowed and awarded the first William C. Brown Fellowship in MPT. Ga Tech's ECE Dept. awarded the first William C. Brown Fellowship (Fall 2013). We would like to increase the Fellowship's endowment. Wireless Power Transfer would gently beam SSP's power to large, nearly transparent antennas that would collect it on the ground, which could support growing crops underneath. We have thousands of satellites in orbit now - so we understand most of the technology. Japan's USEF consortium has a $2 Trillion yen project to build a prototype SSP satellite by 2025. The best pathway to initiating SSP construction is a public/private corporation chartered by Congress. Sunsat Corp would be modeled on Comsat Corp, a previous public/private corporation, chartered by Congress in 1962. Comsat created our very successful global communications satellite industry. Sunsat would create a power satellite industry. Join us in helping to fund our educational and technical efforts and to introduce this clean reliable giant among energy alternatives, by plugging directly into our Sun - that clean reliable nuclear power plant 92 million miles away. Sign up for our newsletter, donate to this work, get plugged-in. Learn about the Sunsat Act and the energy transformation we need! Help make a real difference as we rebuild our energy and economy by moving energy production off earth to the High Frontier. - Write your Congressman to charter a Sunsat Corp! Educate the Energy experts that have never heard of SSP !! SSP overview, 79 min video, Ga Tech's ECE6390 class project will design an SSP System).